Imagine having a condition with symptoms so severe that you can’t leave the house, yet our doctor tells us all our tests are negative – often meaning that it’s all in our head. About two in ten people in the UK have IBS and it can develop at any age, with the first symptoms often appearing between 20 and 30 years old, and with women being twice as likely to get it as men. These people are plagued by uncomfortable and often disabling symptoms like bloating, cramps, diarrhoea, constipation, and pain. I have clients with IBS, some of whom have suffered for years without relief. They have blood tests and scans but cannot find the cause of the illness, so they are told to just get more fibre or offered drugs – sedatives, anti-spasm drugs, or antidepressants. For most people that is NOT the answer. Most of those treatments don’t work because they are treating the symptoms but don’t address the underlying causes of why our digestion is not working. I have been successfully treating irritable bowel syndrome and other digestive conditions by helping to identify and remove the underlying causes and restoring normal digestive function and health. How Gut Imbalances Can Lead to IBS: The surface area of our small intestine, where food is absorbed, could cover a tennis court if stretched out. Our small intestine is also the site of more than 60 percent of our immune system. If the lining of our intestines breaks down – from stress, too many antibiotics or anti-inflammatory drugs, steroids, intestinal infections, a low-fibre, high-sugar diet, alcohol, and more – our immune system will be exposed to foreign particles from food and bacteria and other microbes. This will trigger and activate immune response, allergy, and will irritate our second brain (the enteric nervous system) creating havoc that leads to an irritable bowel, an irritable brain, and other system wide problems including allergy, arthritis, autoimmunity, mood disorders, and more. The gut has a mind of its own and the gut’s brain or the “enteric nervous system” is located in the sheaths of tissue lining the oesophagus, stomach, small intestine and colon. Considered a single entity, it is a network of neurons, neurotransmitters and proteins that zap messages between neurons, support cells like those found in the brain proper and a complex circuitry that enables it to act independently, learn, remember and produce ‘gut feelings’. The gut’s brain is reported to play a major role in our emotions, with many gastrointestinal disorders like colitis and irritable bowel syndrome originating from problems within the gut’s brain. When our gut bacteria are out of balance – when you have too many pathogenic bacteria and not enough healthy bacteria — it makes us sick. If the bad bacteria take over – or if they move into areas that they shouldn’t (like the small intestine which is normally sterile) they can start fermenting the food you digest, particularly sugar or starchy foods. This is called small intestinal bacterial overgrowth (SIBO) and can be a major cause of IBS. The major symptom this causes is bloating, or a feeling of fullness after meals. What causes this bloating? The overproduction of gas by the bacteria as they munch on our lunch! Small bowel bacterial overgrowth can be diagnosed by a breath test, which measures gas production by the bacteria, or by a urine test that measures the by-products of the bacteria after they are absorbed into our system. However, unfortunately, more than one factor that leads to IBS and another major cause is food sensitivities. Not true allergies, but low-grade reactions to foods that drive so many chronic symptoms including IBS, often gluten and dairy but not limited to these foods. Research tells us that these are the two main causes of irritable bowel – food allergies and overgrowth of bacteria in the small intestine – but there may be others, including a lack of digestive enzymes, parasites living in the gut, zinc or magnesium deficiency, heavy metal toxicity, stress, and more. This is precisely why it is so important to personalise treatment based on the unique circumstances that exist for each person who suffers from IBS — the solution is most certainly not one-size-fits-all. But solutions can be found if we look carefully at the underlying causes and treat them. Try an allergy elimination diet for a few weeks – eliminate the most common food allergens for 12 weeks – dairy, gluten, yeast, eggs, corn, soy, and peanuts. And then reintroduce them to see if they cause symptoms. This is an effective way to isolate the foods that may be causing you problems. I can arrange these tests for my clients or use kinesiology to find them. 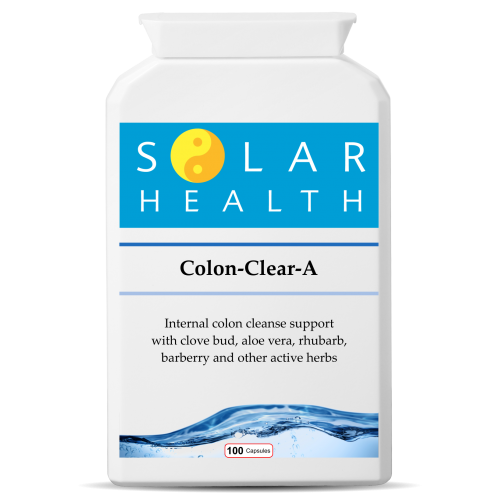 Repopulate the digestive tract with good bacteria – leaving no room for the pathogenic bacteria and keeping it under control. Try digestive enzymes with meals to help break down food while our gut heals. You also may benefit from nutrients that help heal the lining of the gut including fish oil, GLA (from evening primrose oil), zinc, vitamin A, glutamine and others. The first thing stress does is divert blood away from our gut to feet and fists so we can fight or run! This means digestion is shut down so food stays too long in the system and starts to rot and ferment – so there’s your gas and bloating! The bowel shuts down because having a ‘poo’ right now is not going to save your life so we get constipated. Conversely, the bowel empties because if we took a blow to a full bowel and it ruptures, we’re probably not going to survive, so there’s the loose bowel, with some people swinging from constipation to diarrhoea. Our heart rate increases to get more oxygen to our muscles so we can fight or run. Only we don’t fight or run so we end up feeling on red alert, wired and anxious. We can even get palpitations and panic attacks. We release stored sugar from our liver and muscles so we have energy to fight or run. This leads to high blood sugar which our body knows is not good for us so it acts to lower it. But it over-reacts so we end up with low blood sugar and then we need a stimulant to get it back up, leading to cravings for sugar, coffee, tea, fizzy drinks and other stimulants. By taking steps to support our stress response and seeking out the underlying causes of IBS you can dramatically improve our health and overcome our digestive problems. If your symptoms are new or have changed, it’s important to speak toy our GP to see if it is IBS causing them.